I am here with a quick project that I did the other day. We'd had an old green chalkboard in the garage for several years. 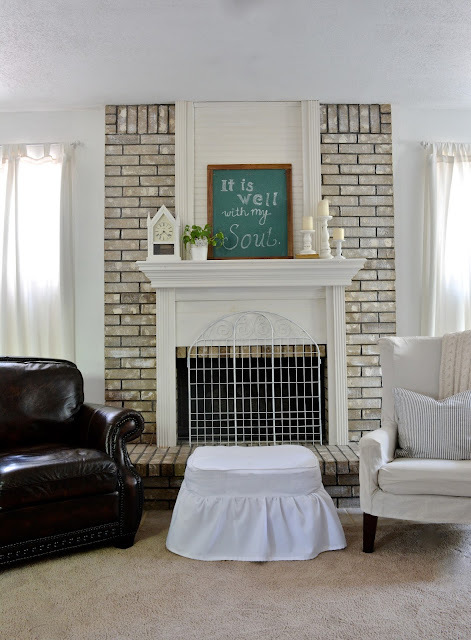 Joanna Gaines had a similar framed chalkboard in one of her reveals. I loved it and I knew we had the stuff on hand to make it. To see more, go to my all things Magnolia Market board on Pinterest. 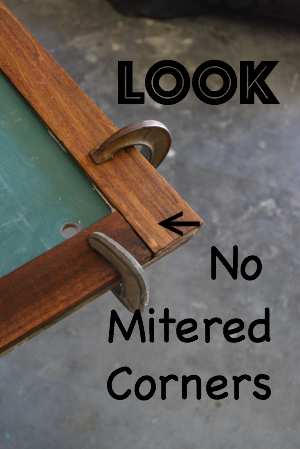 This frame should have mitered corners if I had better skills. If Mr. Troll was here it would have mitered corners. SEE THIS POST TO MEET MR. TROLL. I'll be honest and tell you that I'm not good at miters. It takes a lot of caulk to fix my corners. Geometry - I just don't get it. Sometimes a girl has got to do what she's got to do. I dug out my lath strips. Lath is a thin wood that was commonly used for plaster walls. It can be used for craft project like this. 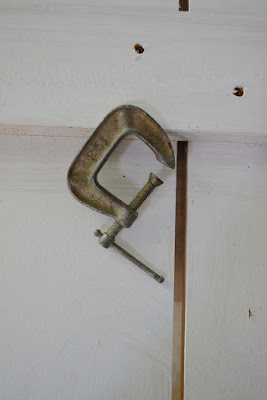 I used it for my laundry room board and batten wall. Measure your lath and cut it with the saw of your choice. Be sure you wear goggles or glasses. I got this saw for Bill for his birthday last year. It's sort of a gift to myself too. I tested several samples of stain. Red Mahogany by Minwax ended up being a great mid-tone. Liquid Nails was a great adhesive for this. I glued the lath directly to the chalkboard. Bill had an ample supply of these darling mini clamps. Pinterest was a good resource and I used it to help me with the lettering. I knew what I wanted to say but needed help with fonts. This is a conglomeration of several artists' fonts. We have several black chalkboards but this is our first green one. 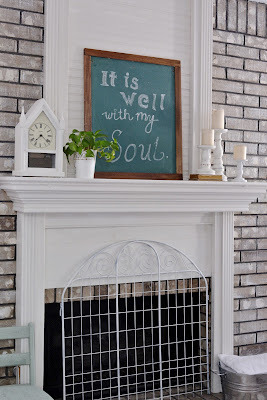 If you do not want green you could make this with black chalkboard paint. 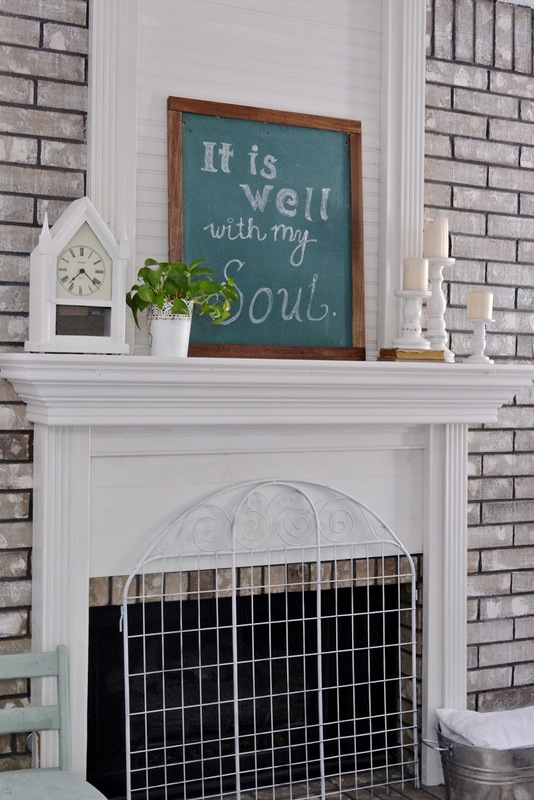 Paint a piece of wood and frame it with lath. This is wonderful Katie! You have inspired me. There is nothing better than creating something from something on hand. This does look super easy. 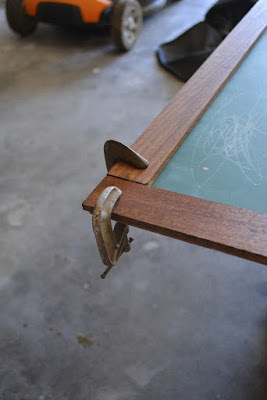 Even I could do this... using glue, not nails. I am inspired. It looks great. 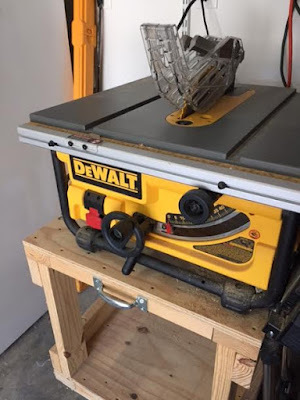 I am also inspired by your saw! When I grow up I want to learn how to use power tools. Chalkboards are always fun...you did a great job on yours, Katie. 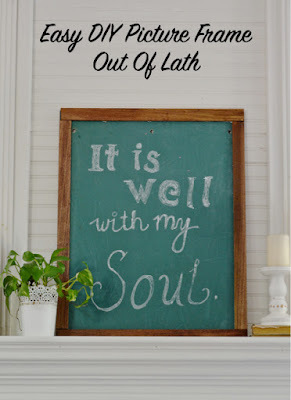 It Is Well With My Soul...one of my favorite hymns. Katie, the chalkboard is kind of fun green. That's what color all of the old ones use to be. You did a great job on the frame! 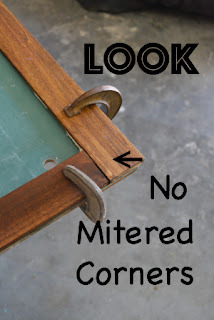 I leave the mitering to my hubby. :) I think the way you did it has more of a vintage feel. Thanks for sharing with SYC. Your picture frame and the quote look great! Thanks for sharing at Brag About It. I'll be featuring this at tomorrow's party.